Hi I’m Jan! I’m a small business owner and lover of all things creative. I discovered this passion of creativity, after several corporate layoffs, and decided to do something about it. After about a year of developing this newfound admiration for art, my husband discovered this sweet little gift shop called The Gift Box. It was love at first sight! We opened our doors in January 2001, and the rest is history. Every item we carry in our gift shop is handpicked with our customers in mind. We strive to provide our loyal shoppers with something new, affordable, and distinctive. When you visit us, expect to find items such as candles, soaps, lotions, women’s jewelry, scarves, ponchos and handbags, along with a fabulous array of home decor with a primitive/shabby chic look. 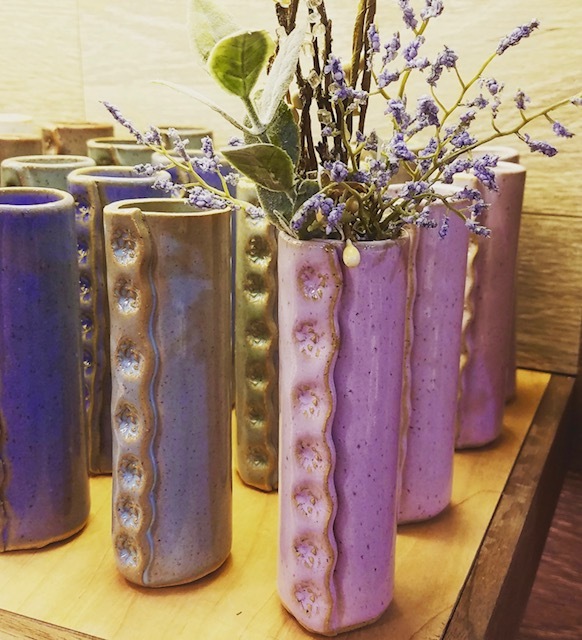 We find the beauty in artwork created by several talented local artists such as pottery, hand-painted black and white checked items, stained glass, knitted sweaters, hand sewn home décor, and recycled/repurposed wood items. We work closely with them in much of their designing to accommodate the needs of our customers and friends. The shop has a warm, cozy atmosphere with an antique country flair and radiates a familiar, welcoming feeling that envelops you the minute you walk through the front door. A place to escape and unwind from your busy day. We and our staff take pride in providing top quality customer service to make each person who enters feel special. We host several events throughout the year. If you would like to subscribe to our newsletter, click below to sign up. “When I visit The Gift Box it is not only a place where you get a gift to give, but you also receive a gift of conversation joy and a sense of home. It is an experience you won’t forget and you will always have the desire to want to go back, because The Gift Box is certainly a “gift”.